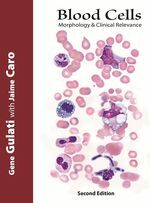 Thoroughly revised by well-respected educator and clinical laboratory hematologist Dr. Gene Gulati and his colleague Dr. Jaime Caro, the new 2nd edition incorporates more discussions, images, entities, artifacts, and mimics in the blood. It brilliantly illustrates an even broader spectrum of morphologic variation in red and white blood cells. Blood Cells, 2nd Edition gives you more on every page; everything that made the 1st edition a perennial bestseller and new additions that make it invaluable for the lab. And now the eBook-only StudySet brings you an additional 124 study questions, for self-study and review! With indexing of images, quick comparative tables, and an entirely new self-assessment test comprising over 100 questions with answers indexed to discussions in the text, users in their everyday professional practice or learning process will find this 2nd edition immensely informative and useful.